Have you been following the blog tour? There have been some great posts and interviews. Has this book caught your interest? It certainly has caught mine. I'm fascinated with Major McDunn and his appearance in the world of Pride and Prejudice. I want to know more. How about you? Colin, I give you the floor! Hello fellow Austenites. 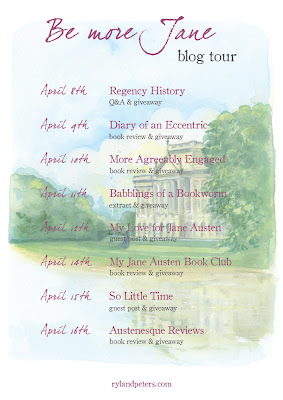 Today I’m doing a guest post for Janet Taylor’s More Agreeably Engaged blog in support of my fourth novel, Perilous Siege. I want to thank Janet for hosting me here, and I also want to give kudos to Claudine Pepes for arranging everything. 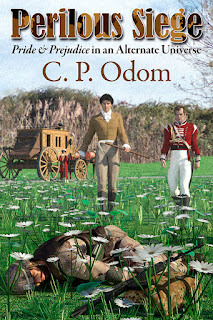 This is the last scheduled stop on the tour, and the topics have ranged from a book review to a long post discussing the 3D images I generated to a vignette about an interaction with Darcy and Elizabeth at the Pemberley ball that got ripped out of the text as I struggled to write that intense event in a way that satisfied me. So now we come to this last stop, and the question in my mind was, what do I write about? What would people who might read this novel want to see? What would interest them? So after considerable thought and a serious evaluation of the alternatives, I decided to . . . ramble. That’s right. I haven’t a clue what would be a good topic. So how about if I go where the muse takes me? Firstly, for those who wonder where authors get their ideas (aside from Hollywood script writers, whose answer seems to be, “Let’s re-make things we made that were successful.” Yuck), my best place for ideas seems to be during my morning shower. I’m still trying to wake up, the cobwebs are only slowly dissipating from my mind, and I must be in a receptive, free-association state. That’s certainly what happened with Perilous Siege. 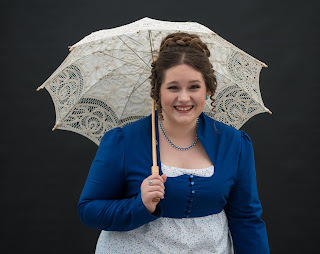 The thought that popped into my head more than three years ago was, “What if I could go back to the world of Pride and Prejudice and be one of the other characters?” Not a character who has anything to affect the story, but a third-person who could watch things happen with a modern-day perspective. As brain-storming goes, ideas started popping into my head, and the first was to make it possible by a variation on The Time Machine. Of course, that one got dismissed immediately. It wasn’t because fictional time traveling isn’t a viable concept (in fiction, at least, though Einstein says it’s impossible), but because even with a working WayBack Machine, you can’t go back to a time that never existed (except in Austen’s fertile imagination). That then led to another science fiction concept, that of parallel universes. Ah, I said to myself, with an infinity of parallel universes resulting from different outcomes in history (the South won the Civil War, the American Revolution never took place, etc. ), there would be one world where Austen’s characters lived and breathed. Now we’re cooking, I told myself. But I had to get my modern-day observer back to the world of that interests from the modern-day world. I briefly considered some kind of interdimensional shuttle such as used by H. Beam Piper in his Paratime series, where the Paratime Police protected the secret of paratime travel. But I really couldn’t see how that would get me what I wanted. At almost the same time, I remembered Witch World, a science fiction novel written by Andre Norton (really Alice Mary Norton), in which the protagonist, a black marketer in the years after World War 2, is fleeing from contract killers set on his trail. The Siege Perilous was the means of transporting him to the Witch World, a completely fanciful world in which female witches make magic. Aha! I thought. That’s how I’ll get my character to a similarly fanciful Regency England in which fictional character roamed the country! However, it was easier said than done. I didn’t want my character to be a criminal of sorts, as was the male protagonist in Witch World. I wanted him to be admirable enough to form a friendship with Fitzwilliam Darcy so that he might get to view all the events in Pride and Prejudice through modern eyes. But the Siege Perilous of legend was supposed to have disappeared when Arthur’s knights dispersed after his death. My modern-day observer couldn’t go looking for it. There would be no ads on the internet to come be transported to the world where you belonged for only $1,999.99. He had to happen upon it by accident, and, since I wanted to stir the plot with the differences between the United States and Regency England, I had to get him to England. As well as in trouble, so he would take the one-way trip through the Siege. So, since post-Apocalyptic scenarios have been flourishing lately (at least, judging by the programs on Netflix my wife sometimes watches when I’m trying to get to sleep), I decided to put my character into an end-of-the world scenario in which he was one of the Marines sent to England sometime in the future to save it from barbarian invaders. I know it’s a stretch of the imagination, but the whole setup was going to be completed in the Prologue. 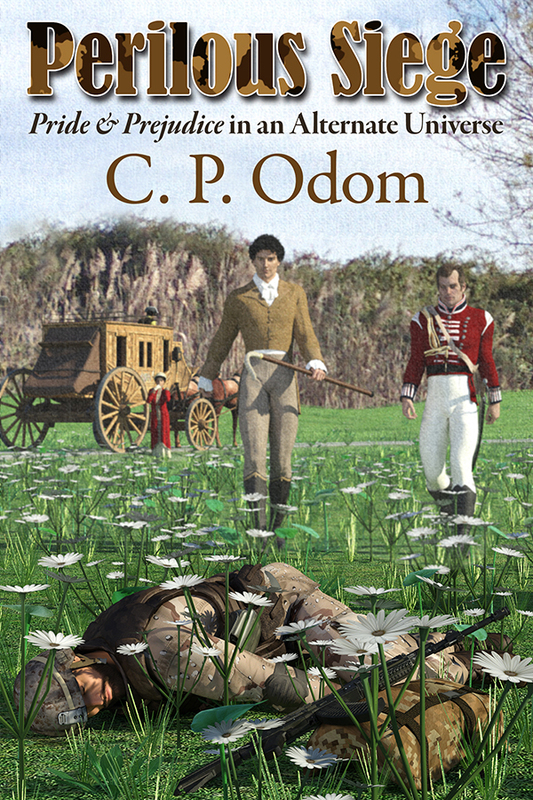 He’d get transported to the alternate world of Austen’s Regency after the last of his Marine unit was overrun and he was grievously wounded. With virtually everyone dead, then the priest whose family had cared for the Siege after it was returned to Cornwall upon the demise of Camelot could emerge from a cave and rescue our wounded observer. He’d be sent on his way at the end of the Prologue, and the first part of the book (about a third) would deal with him finding a place at Pemberley. Then I could get down to the meat of the novel and deal with what happens with Darcy and Elizabeth. Now, the reader might ask if everything is going to transpire as it did in Austen’s novel. After thinking this over briefly, I didn’t want our observer to see Pride and Prejudice carried out as if the characters were actors reading from a script and performing for his benefit. After all, our observer might throw in a monkey wrench merely by being around. Even if he makes every attempt to refrain from interference, it might not be possible to do so. 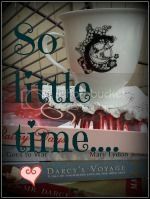 Since he and Darcy would become friends, he likely would travel with the Darcy family just as Bingley and his sisters did. So I decided to let the character of the various people be much as in canon, but I wouldn’t feel compelled to have them do and say the same things. In short, there were going to be differences. I’m not going to say much about the ending except that I came up with how I wanted to end things at about the same time as I started sketching in the plot outline and actually writing the Prologue. So, I ended up with a starting point and I knew how I wanted to end things. Now I just had to flesh out the plot outline to go from start to finish. Piece of cake, right? Well, not exactly. As in so many cases, the devil is in the details. For example, I had a terrible time figuring out how to write the Pemberley ball sequence. I had about four or five different scenarios, some of them written with some detail, and I didn’t like any of them. 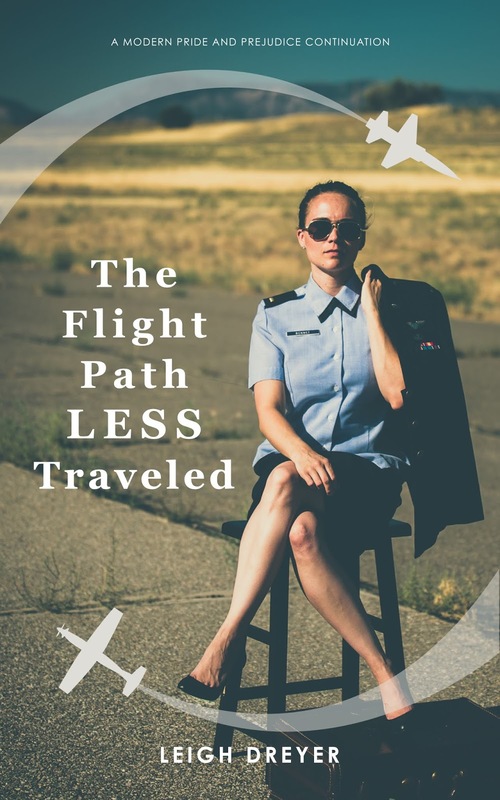 I couldn’t figure out how to make them work, whether I stuck to Austen’s plotline or sailed off into the wild blue yonder. On one of my previous blog stops, I collected one of those discarded variations and posted it as a vignette that got snipped from the action. Anyway, I’d done a fair amount of writing—some sixty thousand words, to be honest—with a lot of in-between stuff consisting of ideas and conflicts with what I had written. So, for the first time since I started writing in this genre, either in fanfiction or for publication, I came face-to-face with the abominable snowman of the writer. The dreaded Writer’s Block! I’d always known it existed—but for other writers. I knew I was fortunate not to have encountered it. Somehow, when I sat down at my laptop, the words just seemed to flow. My fingers were living a life of their own, and everything was good. Now my writing muse went into hiding. In my first stop on this blog tour, I wrote of my attempt to jump start my fingers by doing some 3D art to illustrate how I thought various characters and certain scenarios might look. But I also mentioned that this artistic effort didn’t really have much effect. I was stumped. Plus, right about the same time, my wife came down with a deadly serious kidney infection that got into her bloodstream and almost killed her. She spent a month in the hospital, and she was out of her head for the first four days. It scared me silly. I lost my first wife to cancer, and now I was terrified I might be in the same fix. But things got better, and she eventually came home to recuperate. But it took the next year for her to get to the point where the doctors admitted she was about as close to fully recovered as she was going to get. The critical specialist was her kidney doctor, and he admitted she had suffered some irreversible kidney damage. But he also said she’d die of something else before her kidneys gave out. Not a great prognosis, but one heck of a lot better than what I’d been listening to for a year. So, from late 2016 to the end of 2017 was a complete wash as far as Perilous Siege was concerned. And, when I tried to sit down at the laptop and pick up the threads of the story, I usually found myself pursuing other avenues. That whole period was when I started building model airplanes, ships, and tanks, something I hadn’t done since I was a teenager. But it kept me busy when Jeanine was sleeping or resting, but I was just a room away if she needed me. But a solution was on the way, even if I didn’t know it. Around the end of 2017, I’d given my approval for my wife to look for a Rhodesian Ridgeback canine from one of the rescue organizations. She found a nice dog (who’s turned out to be a GREAT dog! ), but he was in Texas and was suffering from heartworms. It was August of 2018 before he was cleared to travel, so we set off in our van to pick him up. It was on that trip that I finally defeated my Writer’s Block. I’d talked over some of what I’d considered, and my wife made suggestions. Unfortunately, they were pretty far reaching suggestions which would have turned the book into virtually a science fiction novel, so they didn’t make the cut. But they did make me think, so I was pretty busy getting everything down on paper and then setting out to really write. My fingers were alive again, and I informed Meryton Press that, after an delay of three years, I was finishing up another novel. I turned it in at the end of October, and Debbie Styne and I finished editing it right at the end of February. So there you probably have more than you wanted to know about what goes on in an author’s mind when he’s putting a book together. I hope I’ve entertained you a bit, and I want to repeat my thanks Janet Taylor for hosting me and Claudine Pepes for managing everything on this blog tour. everyone in the Regency universe of Pride & Prejudice? and indeed, his whole world. Prejudice, this refugee from a future Armageddon is befriended by Darcy. and the complex and endearing Elizabeth Bennet? 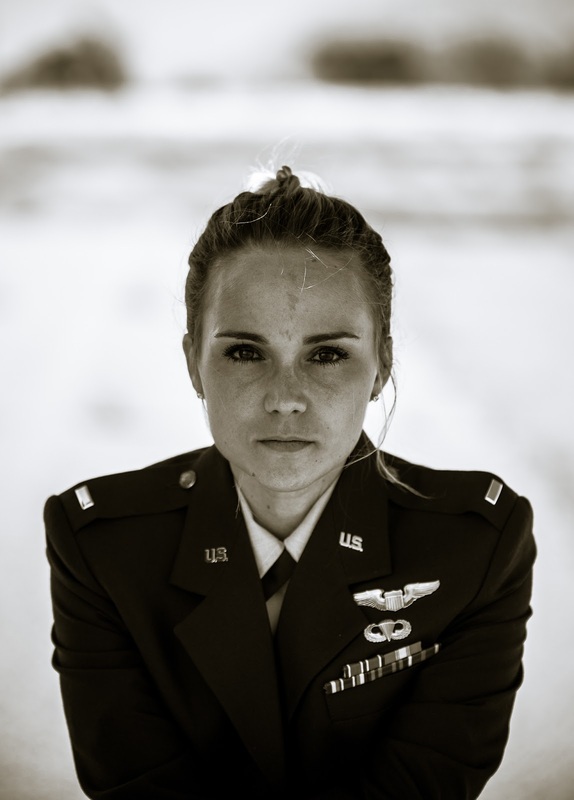 By training, I’m a retired engineer, born in Texas, raised in Oklahoma,and graduated from the University of Oklahoma. 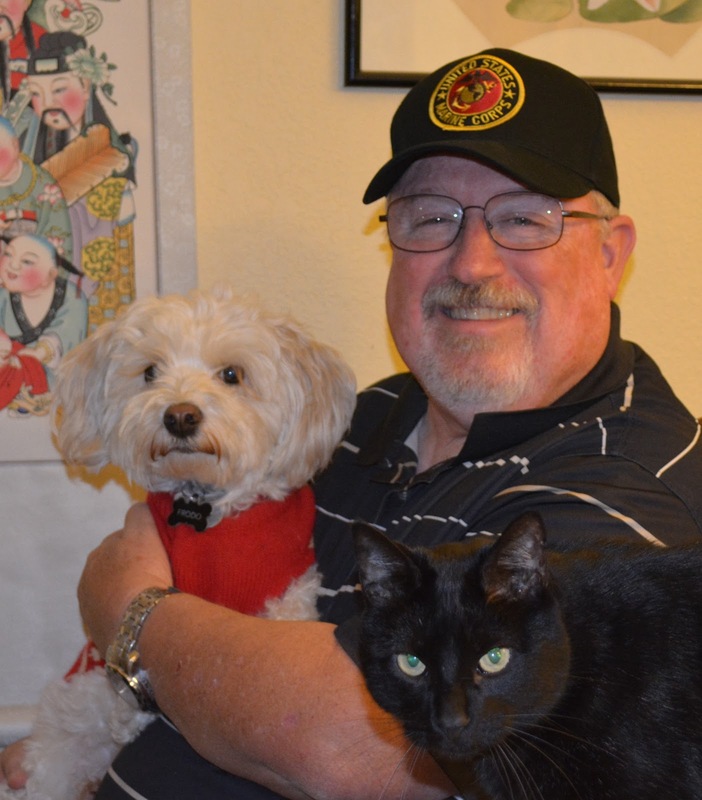 Sandwiched in there was a stintin the Marines, and I’ve lived in Arizona since 1977, working first for Motorolaand then General Dynamics. I raised two sons with my first wife, Margaret,before her untimely death from cancer, and my second wife, Jeanine, and I adopted wo girls from China. The older of my daughters recently graduated with anengineering degree and is working in Phoenix, and the younger girl is headingtoward a nursing degree. was recently published in the second quarter of 2019.
building plastic model aircraft and ships (when I can find the time). Congratulations to C. P. Odom for designing the artwork for his cover. From what I've been told, that's a first at Meryton Press. A special thanks to Claudine Pepe for organizing this blog tour and to Meryton Press for the giveaway. Meryton Press is offering eight eBooks copies of Perilous Siege. Thank you for your support with these giveaways. The giveaway runs until midnight, April 21, 2019. Congratulations, Mary! Thank you for visiting my blog and commenting. I appreciate all who stopped by. Your comments are always enjoyable to read. and having the giveaway. I hope you will visit again. 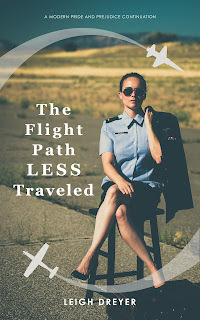 Leigh Dreyer stops by on her blog tour for The Path Less Traveled, her latest release. Leigh asked if I would like her to write something special for my blog. I wanted her to write about something of interest to her. This might not have been her first choice,but it is an excellent choice about the influence of war on Jane Austen and vice versa. It was certainly something interesting to me. I think you are going to enjoy reading her post and hope you find it interesting too. Welcome, Leigh! I'm glad to have you back for a visit! Janet asked me to write about something I particularly like or enjoy writing about. Considering I spend the vast majority of my writing time writing speech notes and assessments as a speech pathologist, I didn’t think that would be of any particular interest to anybody (except maybe Karen M Cox—Speech path shout out!). Something I do enjoy that may be of interest in the Austen space is the influence of war on Jane Austen and, additionally, of Jane Austen on war. Jane Austen lived from 1775 to 1817. The American Revolution began the same year in 1775 and ended when Jane was eight in 1783. The war of Britain against Napoleon started in 1799 and ended in 1815. At it’s peak in 1804, approximately one-fourth of military age men joined volunteers to fight against Napoleon. Simultaneously, the War of 1812 raged against the United States from 1812-1815. The number of British war dead alone in that time period is approximately 345,000 or around 4% of the total population of Britain in 1801. Famously, two of her brothers were in the Navy, while another was in the militia. Her sister Cassandra’s fiancé served as curate on a ship in the Navy and died of a fever in 1798. Rudyard Kipling wrote “The Janeites” to highlight Jane’s impressive influence on veterans in World War I. In 1942, during WWII, Penguin published special editions of Northhanger Abbey and Persuasian to be sent to the troops. Jane Austen has a power to connect men and women of all social standings and across more than two hundred years. Her books and words are powerful reminders that people are all the same and can connect through conquering pride and prejudice. Like Jane, we have lived in a world which has been in a constant state of war. Depending on your age, the Korean War, Vietnam, the first Gulf War and Bosnia to the Global War on Terror (which has lasted nearly twenty years), I have been in a country at war for most of my life and certainly all of my adult life. 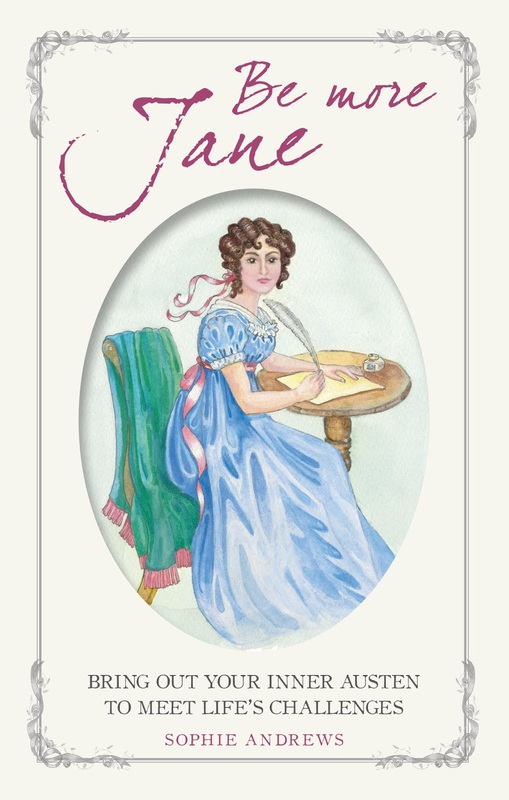 Jane Austen’s works and JAFF in general have helped me through deployments, temporary deployments, moving across the country six times (while pregnant four of those moves and with a six week old one of them), late nights and early mornings alone. I know many men and women who leave their families each morning and are actively participating in a war zone by the afternoon. Today only 1.7% of Americans serve in the military—a huge change from the 25%+ in Austen’s time, but the things that unite us are the same as they once were. A love of country and a willingness to serve…that free college and solid housing plan and healthcare sure doesn’t hurt to the Wickham-types of the world. 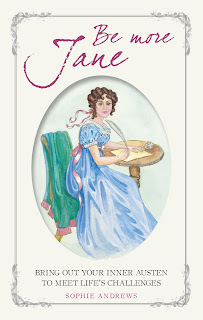 Jane Austen has a power to her writing that is interesting for an author. At once she is satirical, funny, romantic, smart, and authoritative without ever letting on that her writing is any of those things. How many articles have been written about how Pride and Prejudice is more than a romance? To me, Jane Austen and works inspired by her are a simple (and complex) comfort in a time of war. It is great having you come back to my blog, Leigh. From everything I've read, it sounds like your book is doing really well. Congratulations! Thanks for the awesome post. I enjoyed reading it and I'm sure my readers did too. Thank you for bringing the influence of war on Jane Austen to us. Leigh is giving away one eBook and the giveaway is international. Leave us a comment and tell us what you think about the post, Leigh's book, or just leave her some love. The giveaway will end on the 4th of April at 11:59 P.M. Good luck to all. Best wishes to you, Leigh Dreyer! 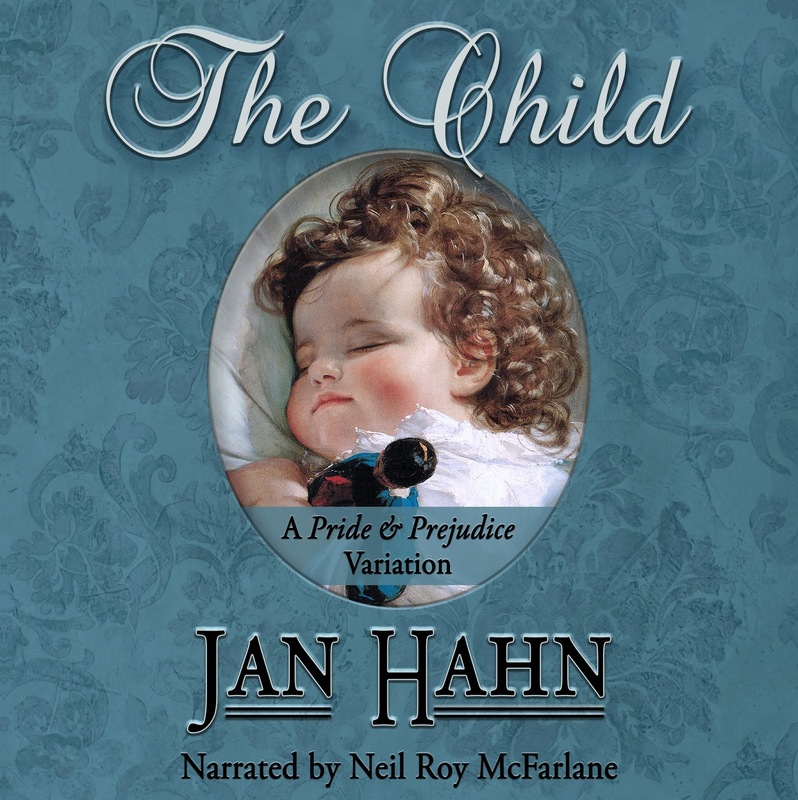 I am ecstatic to announce that Meryton Press has published its first audiobook. It has been an exciting few months of listening and getting everything ready for the audiobook release. My guest today is here to talk a little about the process and the selection of the narrator for the audio version of her book. Please welcome Jan Hahn. 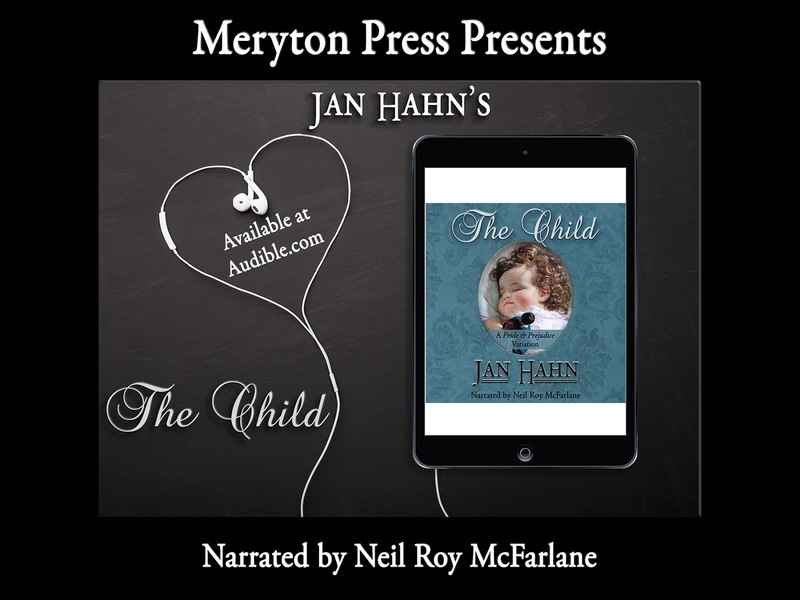 I’m delighted that Meryton Press commissioned an audiobook release of my latest work, The Child. 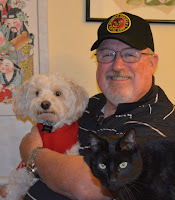 Thank you, Janet Taylor, for allowing me to announce it on your blog. I’m also grateful for Janet’s efforts to successfully guide me through the process of making an audiobook. I could not have done it without her. Together, we auditioned several engaging narrators from which she and I chose the perfect voice for my novel. Neil Roy McFarlane lives in Wales, but he can read in various voices and dialects, even that of a toddler―essential for a book entitled The Child. I love the way he makes my Mr. Darcy come alive with a pleasing voice and a lovely accent. Here is a sample of The Child. Besides narrating books for adults, Neil is a published writer of children’s literature and has released at least one children’s song of which I’m aware. If you feel like smiling, listen to "Boogie Woogie Monkey." I found him easy to work with and willing to spend extra time to produce an audiobook that makes me proud. Neil has a great sense of humor, evidenced by how he can laugh at himself. He made a short blooper reel from The Child for us to enjoy. He calls the first one Romance Allergy and the last one is just Gaaaaaah! When editing a book that I’m writing, part of the process involves reading it aloud to check the flow of words and phrases. I may be caught up in a deeply romantic mood while writing the words Darcy speaks to Elizabeth―picturing Colin Firth or Matthew MacFadyen, of course―and then I open my mouth to read and out comes this Texas twang. Bo-i-i-i-ng! Talk about shattering a mood. For a born and bred Texan, you can’t imagine the thrill I receive when I hear my words spoken in a British accent! Finally, my book sounds right―like I heard it in my head all along. Currently, I’m working with the talented Leena Emsley on my next audiobook, The Journey. I can’t wait for you to hear her version of Nate Morgan, the handsome but dangerous highwayman who abducts Elizabeth and Darcy. Now, how about you? Do you enjoy listening to books? When do you find the time? While driving? Doing housework? Ironing (heaven forbid!)? Or just sitting down with a nice cup of tea? Please share your thoughts on audiobooks and your favorite way of listening to a story. In return, you’ll have a chance to win a free audio version of The Child. As Jan mentioned, Meryton Press is giving away one audiobook of The Child by Jan Hahn and narrated by Neil Roy McFarlane. Jan asked some great questions above and we would love to hear your response to them. Please leave those thoughts in the comments, and don't forget your contact information if I don't already have it. Good luck to all and thank you again for helping make today even more special. Giveaway will end at 11:59 P.M. on the 3rd of April and is international. I have some winners to announce! Yay! That's always good news! Robin Helm's More to Love has two winners. Congratulations to both of you! Thanks for stopping by and commenting. Your support is always appreciated. Robin, thank you for visiting and for having such a generous giveaway. By the way, I love your cover! I think I've said that before! lol I hope the book is very successful. Please come back for a visit anytime. It is so nice to have Robin Helm as a guest. Her latest release, More to Love, is today's spotlight. Robin shares an excerpt and has a giveaway. Thank you, Robin. Welcome! After telling Sarah her plan, Elizabeth crept stealthily through the hallway, down the stairs, and out the front door. The sun had set hours before, but the moon was full, and she knew the way to Oakham Mount as well as she knew her own name. Unafraid, she set out at a brisk pace. As she continued deeper into the trees, she heard a twig snap behind her and looked back. ’Tis only a small animal. No one is there. Another sound, and she stopped to listen, turning slowly. Footsteps. Something large. Her breathing increased. Between me and Netherfield. I cannot go back. She bolted at full speed, hoping to find a place to hide, but her fear drove her forward. I shall run all the way to Longbourn, if I must. Only a few steps into the open space surrounding Oakham Mount, she tripped and fell, sprawling on the ground, hitting the side of her head on a large rock. Just before she fainted, Elizabeth thought she heard someone call her name from a great distance. I know that voice. She tried to sit up, but the strong angel stopped her, holding her by the shoulders as he leaned over her. His face is in shadow. I want to see him. She lifted her hand to touch his cheek. There is stubble. Do angels have beards like mortal men? He untied her bonnet and carefully removed it from her head. I am safe with him. She felt his fingers in her hair, lifting her head a bit, removing the pins and setting her curls free. She felt his hands moving gently across the back and sides of her head, stopping over a tender spot. “Do you not remember me? I am Thaddeus Beckett, a physician. Fortunately, your bonnet and hair must have protected your head somewhat when you fell. You have quite a lump, but there is no blood.” His voice was filled with relief. The man stopped and looked down at her. His voice was soft. “You are the most beautiful woman I have ever seen. You are the angel.” He gathered her up in his arms, holding her as if she were a child. Mr. Beckett clenched his jaws, striding towards Netherfield with Elizabeth in his arms. She put her head against his chest, listening to the steady beating of his heart, wanting nothing more than to sleep. 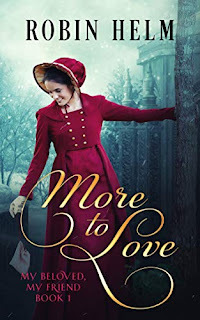 Robin is giving away one eBook, international and 1 paperback, US only, of More to Love. To enter tell us what you think about the excerpt. Don't forget to leave me a way to contact you should you be one of the lucky winners. The giveaway will end at 11:59 AM central on the 16th of March. Good luck to everyone. Thanks, Robin, for including More Agreeably Engaged in your stops.